Our long anticipated evening with IM Lorin D’Costa took place on Thursday 20 August. Twenty-seven eager chess players, including a large cohort of juniors and a number of guests from other clubs were treated to a wonderful evening of coaching followed a simultaneous exhibition. The coaching concentrated on endgame surprises and amongst other lessons Lorin clearly demonstrated that you shouldn’t resign on the basis of long calculations. I’ve done that, only to find moments later that I’d resigned in a drawn position. Of course what counts as a long calculation for me is much shorter than for the GM who made this mistake in the example Lorin shared! If you were at the event and would like a refresher, or weren’t and want to know what you missed, here’s a PDF of Lorin’s coaching notes. The group put up an excellent fight in the simul, and while none of us were able to beat Lorin, four managed a draw, and we kept Lorin playing until a little after 11pm. Many thanks go to the staff at our venue for their letting us stay late! The draws were achieved by John Peters, Steve Lovell, Bob Jones and Laureano Garcia-Munoz. However, the promised book prize goes to junior Daniel Garcia, whose contributions in the coaching and play in the simul particularly impressed Lorin. 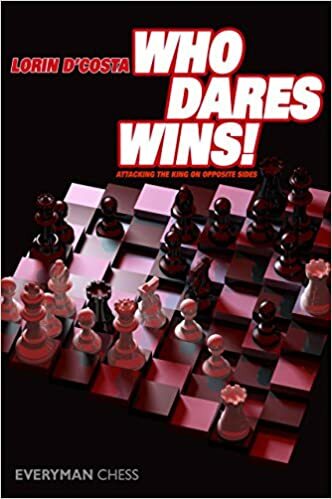 He receives a copy of Lorin’s book Who Dares Wins! Lorin also named John Peters and Adam John as having done especially well. It’s always hard to single out those deserving of a special mention … I think we all did rather well. If you attended and haven’t already given your feedback, we’d very much like to get your views via our survey here. If you’re having problems accessing that, you can download and print this version, fill it out and bring it along to the club. Feedback so far has been very positive, so we’re hopeful that we’ll be able to host a similar event next summer. Thanks for coming Lorin!